who gave their lives in the First World War. 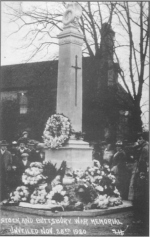 Right is a picture of the unveiling of the War Memorial in November 1920. We hope to bring pictures and more information about these brave souls. We have a strange anomaly with Charles Evens. I had an email from Charles Evans niece who thinks that Charles Geoffrey Evans and Charles Evans were one of the same. Can anyone confirm this? According to sources the war memorial and who was included was rather down to those who set up the funding and there was not a set criteria. There are mistakes on the memorial I am afraid spelling mistakes and even a Christian name wrong that need to be cross referenced.